Honor of the Samurai is a card game set in 16th century Japan and based on historical facts. In the midst of waring factions and continual warfare you become an elite warrior samurai in service of your daimyo warlord. To win the game you must earn honor points in an effort to become the most honorable samurai. Players gain power by building armies, using stealth ninjas, employing house guards, and owning castles and ancient artifacts. 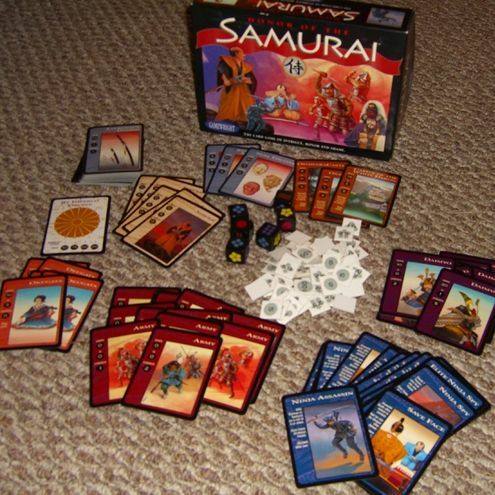 The characters and artifacts represented by the cards, and the game's dynamics and strategies, are closely modeled after real Japanese samurai history. The game can be played by three to six players. It was originally published in 1996.